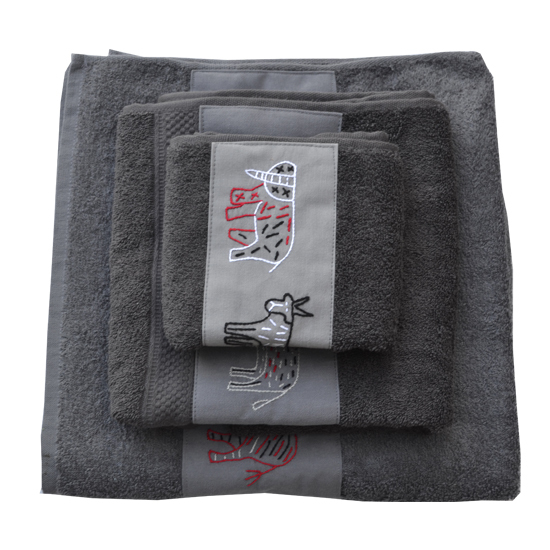 Set of 3 cotton towels with wild animal motifs embroidered strip, made by Penduka artists from the slums of Katutura district, Windhoek. Available in grey with grey/red/black coloured stitching. Set of 3 cotton towels with wild animal motifs embroidered strip, made by Penduka artists from the slums of Katutura district, Windhoek. The contrast between their social environment and this very delicate embroidery confirms once again the enormous differences that one encounters in Namibia day in day out. Available in grey with grey/red/black coloured stitching. One towel each of 30cm x 50cm, 45cm x 90cm and 60cm x 110cm, machine washable at 60 °C. For other specific colour/ size variants or personalised motifs please contact us.